Our tortoise interface isn't the first, but we think it's the best! 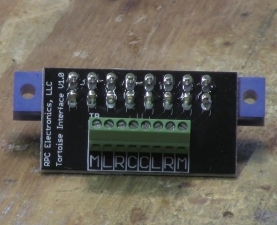 Easily and neatly connect all of your wiring to a Circuitron Tortoise switch motor with just a small flat head screwdriver. No soldering involved! Compact size, fits right under the switch motor's casing. Compact terminal block with 0.1" (2.54mm) on-center spacing. Connections are clearly marked right on the board. No mistaking which connection is which. Pinout matches tortoise pinout.